It was cruel for the Seagulls last season, there’s no doubt about that. You’d think a team that has had their hearts broken so regularly in the Championship playoffs, that heightened dream sequence in the soap opera that is the English second tier, would be immune to disappointment by now, but the way that 1-1 draw against Middlesbrough came to pass on the final day of 2015-16 was particularly harsh on a team that didn’t lose their first league game until the kids were breaking up for Christmas. It was unlikely, nay impossible, for Chris Hughton, a man well known for his good nature and motivational skill, to lift his charges for yet another playoff sortie. Sheffield Wednesday breezed past them in mid-May, and history repeated itself yet again. Hughton’s men were brilliant for huge parts of last season. They lost just five games. Not even champions Burnley lost fewer. Middlesbrough, who finished above the south coasters by virtue of a +32 goal difference, two better than Brighton, lost almost double as many. But if we fast-forward to now, could it be a case of same old Brighton? Or might it perhaps be different? 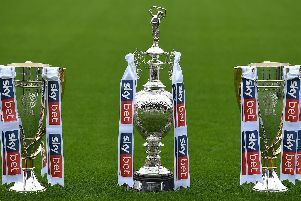 There are similarities of course - Norwich, Newcastle and Brighton are the three best teams in this year’s renewal by a distance, much as Burnley, Middlesbrough and Brighton were last time around, and the way the league is constructed means of course that only two of those three get their wish automatically. It is vital that Hughton channels last season’s disappointment and turns it into something positive, something he appears to have done so far. If they finish a disappointing third again - the exact position they’re in now - it may well be too much to bear. But, that disappointing 2-2 draw against Preston last week, in which the Seagulls were pegged back in injury time by a Simon Makienak equaliser, was followed up in mentally-robust style by a 1-0 win over a Wolves side who, while inconsistent, are certainly capable. It was a textbook example of a game they needed to win if they are to climb out of this division. They did, and despite the late Wolverhampton Wanderers onslaught, they held firm. There are more reasons for Brighton fans to be positive - Anthony Knockaert has a decent claim as being the best player in this league and boasts top-flight experience both here and abroad. He is precisely the type of attacking player that can make a vital difference when the points are totted up in May. Lewis Dunk is a hugely talented centre-half with Premier League potential written all over him, and is only 24 so will still have the legs and appetite for another lengthy Championship campaign. What’s more the manager knows what it’s like to suffer disappointment but eventually lift his side back into the Premier League. Three times in the last four seasons in one way or another this side has felt the crushing disappointment of failing at the final hurdle. If that counts as fuel to drive a team on, then no-one has more in the tank than Chris Hughton and his men. It’d be foolish to bet against them again.